A couple of NYPD cops paid $40 of their own money to bail out a goat that escaped a slaughterhouse earlier this week, taking the gruff former fugitive to a Long Island sanctuary. 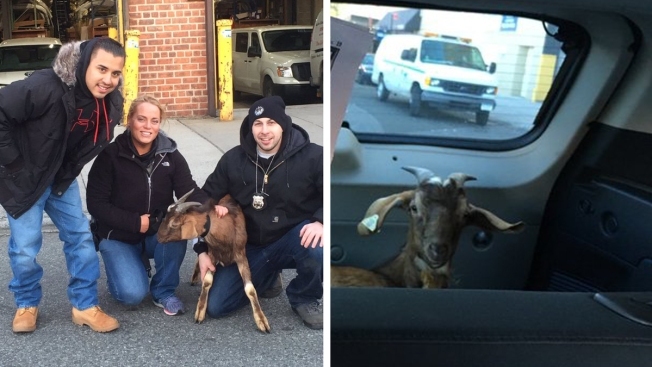 Cops from the 103rd precinct's anti-crime unit caught the baby goat that escaped the slaughterhouse at Merrick Avenue and 180th Street in Jamaica, Queens, according to the NYPD. But when they rustled the escaped kid, the cops decided they couldn't force it to go back. So they decided to pay the slaughterhouse $40 for the animal's freedom. Afterward, the animal, nicknamed "Merrick," got a ride in the back of a police SUV for a short time before being taken to a sanctuary in Suffolk County. Sgt. Mary Humberg, one of the cops who rescued the animal, told DNAinfo that Merrick "deserved his freedom." “He fought crime with us,” Humburg said. "Best $40 I've spent. The goat wasn't the only hoofed escapee in Queens this week. A cow set to be slaughtered Friday busted out and led cops on a chase through the neighborhood on Wednesday.